Charlie Sheen was on the Dan Patrick Show again this morning, saying he’s ready to get back to work, but he’s thankful for the much-needed time off. He also gave props to his network for basically saving his life. When asked if CBS made the actor stop working so he could get healthy, Sheen first paused to take a quick drink of water for his dry mouth. On a more serious note, the actor said he is “supremely grateful” for the support he’s gotten from network, which shut down production of Two and a Half Men so the star could recover. Charlie Sheen went on to admit that while he had “never been drunk – [and] never been high on the set once,” he did show up looking haggard. …he confessed he’d been showing up in rough shape without having slept and would ask the director to move his mark so he could lean on a piece of furniture for support. With all of that now supposedly behind him, Sheen is ready to get back to work. And dispense advice to fellow struggling addict, Lindsay Lohan. previous post: Michael Lohan Does Something Behind Lindsay Lohan’s Back. Again. 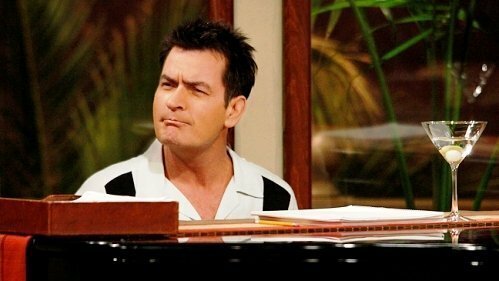 I haven’t kept up as much on the Charlie Sheen saga, since it seems such a repeat of drama that’s happened before. It appears to me that he’s more concerned about getting back to work than he is about maintaining (or achieving) his sobriety. Makes me question just how long Charlie can be successful about being clean and sober when it’s not a priority with him. Glad CBS was able to intervene for his well being. However, the success of the intervention is dependent on how seriously he wants to work on his sobriety. Going by Charlie’s past history, I don’t have the utmost faith in him succeeding for long. Interesting he suggested Lindsay Lohan work on her impulse control. Hope he’s practicing what he preaches. 53 queries in 1.966 seconds.